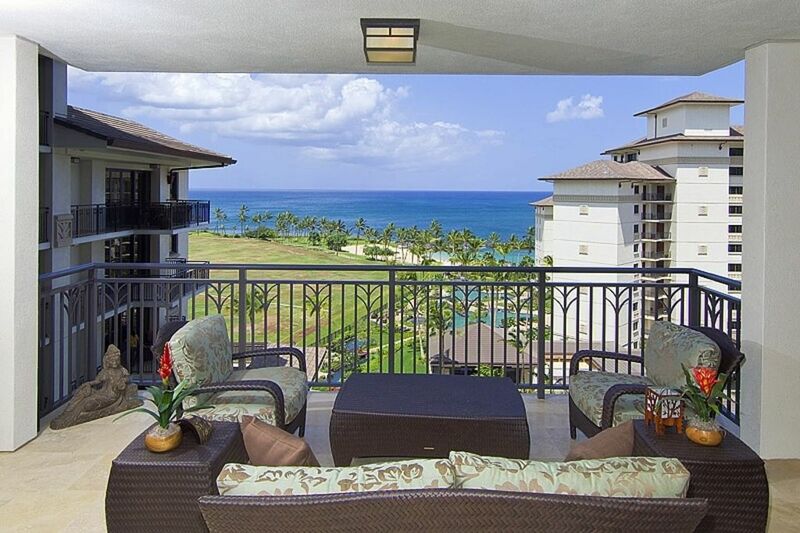 Located on the 9th Floor at the front of the Ocean Tower building, this 3 bedroom 2.5 bath Asian inspired unit features a breathtaking view of the ocean and pools from the lanai. Custom kitchens designed by Hawaii’s foremost chef, Roy Yamaguchi, equipped with Sub Zero and Wolf appliances. The luxury villas are designed for the Hawaii lifestyle featuring interior finishes by renown interior designers, Philpotts & Associates. A semi-private elevator will take you directly to the unit. Beach Villa at Ko Olina are located on lagoon two within the beautiful Ko Olina resort, Oahu's premier ocean front resort community. Guests can experience a wealth of amenities at the Ko Olina Resort and Marina from championship golf to lavish spa treatments at the Ihilani Spa – all within walking distance. The lagoon, protected by a coral ridge, is a swimming and snorkeling paradise no matter what the surf outside. * Roy Yamaguchi Signature Kitchen. Each luxury Hawaii villa comes with a custom kitchen featuring Wolf and Subzero appliances in an island design - perfect for entertaining. * Koi Ponds, waterfalls and lush landscaping that enhance the beauty and bring a sense of serenity to the resort. * Expansive lanais with pocket doors for a seamless transition between indoor and outdoor living. * Resort design for the Hawaiian lifestyle featuring interior finishes by renown interior designers, Philpotts & Associates. Fitness Center and Member's Lounge now OPEN to ALL guests. UPDATE: The Lap Pool near the Ocean Tower has REOPENED with new tile in both the pool and spa, new rails/ladders, depth markers, LED underwater lights, swim lane markers, and outdoor shower! Kahara Ueno/Starts International Hawaii, Inc.
About Kahara Ueno/Starts International Hawaii, Inc. Even in Hawaii, it is rare to find a true beachfront property where you can walk out directly on to a pristine beach in an exclusive gated resort. View more about Kahara Ueno/Starts International Hawaii, Inc.
One of the newest beach front resorts in island of Oahu. Golf course view from master bedroom lanai and other two bedroom windows. mountain view from master bedroom lanai and other two bedroom windows. Two STANDARD SIZE parking stalls. Additional parking is available at a daily rate of $30.00 + tax. Payment can be made at the Front Desk by credit card (Visa, MC, or Amex) only. Dining area is next to living room and kitchen A booster chair is available upon requests. The Lap Pool near the Ocean Tower has REOPENED with new tile in both the pool and spa, new rails/ladders, depth markers, LED underwater lights, swim lane markers, and outdoor shower! We stayed here for a spring break trip with our 3 kids (17, 15, 11) plus grandma and grandpa. It was perfect. Beautiful ocean, beach, lagoon, and access to everything Oahu has to offer. This 3 bedroom villa was perfect for our family and had everything we needed - from a fully stocked kitchen to snorkeling gear. Can't wait to come back! Perfect in every way ! The view, the quality of the apartment, the pool and beach, nearby stuff all combined for an unforgettable vacation. Will return! It was our second time to stay in the Beach Villa, the first time was different 3BR unit which we liked very much, so we came back but this unit was even better. Very spacy, clean, well equipped and with nice oriental interior. We thought the price was very reasonable compared to the price of two hotel rooms as we were a family of 6. Ko Olina is a beautiful resort that I could feel very relaxed. As this unit has a full size Kitchen with all necessary tools, no need to go out to eat breakfast and there is a store located in the resort which is in walking distance, it is sufficient to buy foods for light meals. Major super markets located within 15min drive, there are casual restaurants in the center of the resort (walking distance) and also, fine restaurants are available in the hotels nearby (Four Seasons, Aulani and Marriot). Swimming pool is not crowded, chairs are always available and the beautiful lagoon is right outside of the Villa. We would love to come back here for our next trip to Oahu. This villa was absolutely amazing! The view from our lanai was breathtaking. We get the view of the ocean and also the swimming pools. The villa looked even more gorgeous than the pictures. Very nicely decorated and so comfortable. Joy was a life saver. We had a horrible incident from another vrbo owner where he cancelled our booking three weeks before our vacation. When I was searching for another villa, I ran into joys villa and she immediately booked us at the same rate we had with the horrible owner. I could not thank her enough. She was able to get us two high chairs and a pack and play. On top of that we had two parking spaces! Joy was very professional and so nice. Patrick greeted us when we got there and he was extremely nice as well. I am definitely going to book again with her. Spacious, luxurious, comfortable, great views. Sunset is partially blocked by other building in the summer. The "kids" pool is spectacular...not just a big rectangle, but has lots of coves, shallow spots, and fun areas to explore/play in. The atmosphere is very relaxed, since many of the other guests are residents. Less of a hectic "resort" atmosphere than the nearby resorts. Perfect location right on a lagoon with excellent snorkeling. Can't imagine a better option for staying in Oahu. Golf: Ko Olina Golf Club is Oahu’s premier Ocean View Championship Golf Course. This Ted Robinson designed 18-Hole Championship Golf Course provides exceptional water features, multi-tiered greens, expansive landing areas, no parallel fairways and measures up to 6,867 yards from the back tees. Ko Olina Golf Club features the ProLink GPS System with Golf Course Map, Yardage, Pro’s Tips, and Scoring Capabilities. Golfers can also order food and beverages from their Golf carts on the 9th and 18th holes. Ko Olina Golf Course Highlights: Ko Olina Golf Club has been listed in Golf Digest's 'Top 75 Resort Courses in the U.S.' as well as the 'Top 100 Golf Shops' in America. Former host for Senior PGA and LPGA Hawaiian Ladies Open, as well as the 2006 and 2007 LPGA Fields Open in Hawaii. Ko Olina Golf Club features exquisite dining at Roy’s – world famous for Chef Roy Yamaguchi’s Hawaiian Fusion cuisine, who has also appeared on 'Iron Chef America'. Ski: Ko Olina Marina: The 43-acre Ko Olina Marina caters to both the sport fisherman and the recreational boater with spacious floating concrete docks able to accommodate vessels up to 150 feet in length. The Marina houses 330 full-service slips, the Ko Olina Marina General Store and a fuel dock providing gasoline, diesel and pump-out services. Ko Olina Marina is home to a number of water activity tours, including the Ko Olina Cat, a brand new 53-foot sailing catamaran offering a selection of snorkel, sail and sunset cruise options. This state-of-the-art Marina, the first built in Hawaii in 30 years, has become a blueprint for success with near-capacity slip occupancy. Perfectly set along the beautiful Leeward coastline of Oahu, the Ko Olina Marina provides the ultimate experience in comfort and convenience.